Hundred dollar bills are hard to come by! It looks like I just I cannot stay away from the Apple story, with Tim Cook making a splash (or a belly flop) with his speech in New York yesterday and David Einhorn's proposal coming in for scrutiny from investors and the press. This article in the New York Times DealBook does a pretty good job of summing up the proposal and its underlying thesis, and I was surprised to see my name mentioned, with Mr. Einhorn quoted as having said that my analysis "brings to memory the old joke about the economist who refused to pick up a $100 bill on the street because in an efficient economy, there can’t be $100 bills lying around.” I am flattered that I was even part of this conversation, given that Mr. Einhorn has probably never heard of me nor read my thoughts about market efficiency. I am also grateful that this was all he said about me, because I have been accused of far worse than ignoring hundred dollar bills on the floor. (Just take a look at the comment section of my prior blog posts). My motives for this post are not defensive but I do have a weakness of not being able to let an analogy go, especially when it can be used to good effect. So, at the risk of being labeled an egghead, here is what I think about hundred dollar bills on floors. There is a cost to looking for "free" money: Perhaps, Mr. Einhorn's point is that those of us who have never found hundred dollar bills on the floor have just not been looking, but there are people who do and I am not sure that it is a lucrative enterprise. Using the Penn Station analogy again, there are still a few public phones left in the station, and every day as I walk through, I see people doing the phone scan, where they check the change alcove for money that callers have left behind. Could you make money doing this? I guess so, but it depends upon how much value you attach to your time. And watch your back pocket: I have spent more of my life now in New York City than any other part of the world, and I guess that some of the native New Yorker has rubbed off on me. If I did see a hundred or twenty dollar bill on the floor in front of me, my scam detection antenna goes into high alert. From experience, I know that when something in this city looks like easy money, there is a catch. In this particular case, I would not be surprised to find out when I bend to pick up the "free" hundred dollar bill that it is (a) a fake bill and (b) that my back pocket will be picked while I am bending over. Don't build expectations around luck: If I did find a hundred (or even a twenty) dollar bill on the floor and I felt safe enough to lean over and pick it up, I would feel "lucky" that I found it, but I would not mistake serendipity for skill. I would certainly not build my household budget on the assumption that I will find not one but three hundred dollar bills on the floor every month in Penn Station. That would be not only foolhardy but a recipe for a unbalanced budget. I have nothing personal against Mr. Einhorn, other than the standard New York lament that he is a Mets fan and not a Yankee fan. I have agreed with him more often than not and shared his disdain for the over-the-top assumptions that analysts were making for companies like Green Mountain Coffee. In fact, I will offer an argument for Mr. Einhorn's proposal that I think is more substantive than any that I have heard made yet. His suggestion that Apple issue preferred stock to its common stockholders is built on the presumption that, with interest rates at historic lows, there is a void in the market now for investors (perhaps institutions that need the cash and get a break on taxes on preferred dividends) who would like to make a reasonable return on a safe investment. The assumption is that these investors will pay a premium (over and above "fair" value, given the risk of the cash flow) for the 4% preferred stock that Apple will issue, and that common stockholders will capture this premium (by selling the preferred shares that they are granted by Apple to these "premium paying" investors). That is not an unreasonable argument, but my skepticism is based on two considerations. The first is that if this is true, we should be able to see the evidence in the preferred stock market, where preferred stock issued by companies that have solid balance sheets and substantive cash flows should be trading at premium prices. Is that happening? I don't know, but if Mr. Einhorn wants to make his case stronger, he should present evidence of the phenomenon, perhaps by comparing preferred dividend yields to earnings yields on common stock and corporate bond spreads. The second is the question of scalability. It is possible that Apple's common stockholders may be able to capture some of this premium with the first $50 billion of preferred stock issue, but will the premium persist as the issue gets scaled up to $100 billion or to $430 billion? I don't think it will, but I remain willing to be persuaded otherwise, and the onus is on Mr. Einhorn to provide the justification. In fact, much of the noise around this proposal comes from the misconception that a company can choose both the face value of its preferred stock and the dividend yield. If Apple issues $500 billion (face value) in preferred stock and sets the dividend yield at 4%, that preferred stock will not have a market value of $500 billion. I started this post with the note that Tim Cook was in San Francisco yesterday, delivering a speech to a conference. Listening to what he said, I was reminded of why I continue to be frustrated with Apple's management. First, I don't think any CEO should be labeling a proposal by one his leading stockholders as a "silly sideshow", even if he disagrees with that plan. (Correction: As some of you have noted, Mr. Cook labeled the lawsuit as a silly sideshow, and not the proposal itself. A little more palatable, but Einhorn has the right to sue and Apple has the right to show, in court, that the lawsuit is frivolous and get it thrown out... ) Second, Mr. Cook made a highly publicized speech and told investors nothing of substance. I know that he dropped nuggets of information that may or may not be useful to investors, but talking about how much more money Apple will pay developers next year is the equivalent of a dinner party host with an elephant in the dining room talking to his guests about the the quality of the place settings. At the moment, investors in Apple are centered on the $137 billion in cash that the company has accumulated, and continues to add to, and they want to know what Apple's plans are for that cash. I am sure that Tim Cook has plenty of well paid consultants, giving him advice, but I will offer mine for free, knowing that it will be ignored. Mr. Cook, if you have nothing of substance to tell investors, it is best that you not talk at all, because if you do make more speeches like the one you delivered yesterday, you will more damage than good (as the market response showed)! Returning to my central theme, what would I do if found a hundred dollar bill on the floor? First, I will check my surroundings to make sure that I am not the sucker in a con game, and I will then bend down and pick it up. Second, I hope (to be ethical is easy in the abstract, much more difficult in practice..) that I will remember what my mother taught me and look to see if I can find the legitimate owner of that cash. If I do not, I will think of it as my lucky find and treat it accordingly. I will, however, not spend the following days searching for hundred dollar bills on the floor, nor will I build my investment portfolio on the assumption that I will keep finding more free money on the floor. Let’s say that you are interested in selling your house and hire a realtor, and that the realtor comes back with what she says is the “best” offer for the house, forgetting to mention that she is the buyer. I would assume that you would be screaming about conflict of interests from the rooftops, right? Now, let’s change the story a little bit. Assume that you are the CEO of a publicly traded company that has been targeted by a group, interested in buying the company. Your fiduciary responsibility to your stockholders, if you decide to sell, is to try to deliver the “highest price” that you can get from the potential buyers. But what if you are also heading the buyout group that is trying to buy the company? The conflict of interest you face would be untenable, since you would, as the lead buyer, want to pay the lowest price. That is, of course, the problem in any management buyout and the issue has risen to the surface with the announcement by Michael Dell, CEO of Dell, that he would like to take the company back private for $13.65/share; that would translate into a $24 billion bid for the company, with about $15 billion coming from debt. Dell will be augmenting his 14% stake in the company by investing more of his wealth but he will joined as an equity investor by Silver Lake, a private equity firm. The “fair value” fig leaf: The managers will hire appraisers/investment bankers to value the firm and ensure that investors get a “fair” value. In fact, the board of directors at Dell will (and Silver Lake) have a bunch of investment banks (JP Morgan Chase is the lead bank but it looks like a whole nest of investment banks is involved in this deal and it is unclear who is doing what, though they are all getting paid) that they can draw on to make this judgment on whether the offering price is a fair one. Without casting any aspersions on the valuation capabilities of these investment banks, there is no chance that any of them can deliver unbiased opinions, when so many fees ride on this deal getting done. Will they deliver a value called a fair value to justify the deal? Of course, but that value will be a “legally defensible” value, not a fair one; the gap between the two is a wide one. The “market is right" and "we are paying a premium" kabuki: It is amazing how quickly managers in management buyouts discover the wisdom of markets. As Dell will undoubtedly point out, “if markets thought we were worth only $11/share a few weeks ago, you should consider yourself to be lucky to get a premium on that price”. Interesting argument, but the market price, even in an efficient market, is based on the information that is available about a company, often with the company as the source for the information. The problem in Dell or any other management buyout is that the same management that is buying the company from stockholders has controlled the information spigot for the months leading up to the dal. How do we know that they have not suppressed good news and been liberal about revealing bad news leading into this transaction? I may be overly suspicious of management intentions, but that is the problem when you play both sides of the field. The “open to other offers” defense: Managers are also quick to point out that there is time for other bidders to make higher offers for the company and that they remain open to other offers. Talk is cheap, though, and all this openness requires a board of directors that will seriously consider alternate offers and an acquirer who is willing to surmount the obstacles of a shortened calendar and antipathy from managers. To give Dell credit, it has hired another investment bank, Evercore, to find potential buyers for the company, with their fees tied to their ability to find a higher bid. I applaud Dell for at least trying to create a modicum of fairness in the process, even if the intent is to fend off future lawsuits, but Dell's board has already shown their hand in this deal, as this news story indicates. It is a “big” deal, not the biggest ever but at approximately $24 billion, it does rank among the biggest. Dell is a high profile stock, widely held and extensively followed. Investors believe that they understand the company and its operations. Not every buyout has a marquee name atop the buyer board that has been so closely attached to the company. Michael Dell, who started Dell when he was a student at the University of Texas, became incredibly wealthy from Dell’s success in public markets. While he did take a hiatus from the day-to-day management of the company, he has been the CEO of the company since January 2007. During those last 6 years, Michael Dell has pushed been open about his vision for the company, and with a compliant board has spent billions in acquisitions and investments to expand the company's footprint in the enterprise solutions business. In the fiscal year ended February 2012 alone, Dell spent almost $2.7 billion in acquisitions in pursuit of his dream. I do not envy Michael Dell or his bankers, though they will be richly compensated for their stress, because there are four potential sales pitches that they can make to investors and none of them casts the company or its management (especially Michael Dell) in a favorable light. 1. Company has made expensive mistakes over the last few years, it has not been well managed and the market is right in its recognition of those mistakes. A fair fix: As I see it, there are two possible fair solutions. One is that Michael Dell can take the company private, as long as he agrees to cover the cost of his mistakes. Put simply, take the money that Dell has spent over the last five years on acquisitions and investments (an amount in excess of $7 billion), charge a reasonable return (a break even where they delivered just the cost of equity) and add it to the value of the company now. In fact, Southeastern Asset Management, which holds more than 7% of Dell shares and is the second largest stockholder in the company, made exactly this pitch in a letter that they sent to Dell’s board, when they took Michael Dell at his word, capitalized his mistakes and estimated an value of $23.72 per share. The other is that since Michael Dell claims that $13.65 is a fair price for the shares, he should be willing to be bought out at that price. Perhaps, Southeastern should make an offer to buy out Michael Dell's stake at 13.65/share. If he refuses, it would indicate that this is a fair price for him to buy the company, but not to sell it. 2. Company has made the right decisions over the last few years but the market has been wrong in assessing the effect on value. The pitfall: This creates a more defensible scenario for Michael Dell, since he does not have to admit to past mistakes or misleading investors about them, but it creates a whole new set of problems. If this pitch is true, he is arguing that the market price today is too low, relative to intrinsic value. If he is consistent with this argument, I would expect to see JP Morgan (or whoever his hired appraiser is) to come back tell the board that the offered price is too low and that it has to be raised to a much higher number. I may be cynical, but I feel that this is not going to happen and that the investment bankers are going to come back with a valuation that justifies whatever the Michael-Dell led buyout team decides to do (even if it is sticking with the current offered price). A fair fix: One is to have an appraiser who has no ties to the board, the managers or to Silver Lake make an assessment of value per share. To those who feel that no appraisal will ever be fair, here is an alternate one (and this is one that Southeastern Asset Management has suggested as well). Give the existing stockholders a chance to be part of the buyout deal. In other words, offer the shareholders a choice of either cashing out at the buyout price or staying on as part of the buyout team. Michael Dell could reduce the debt he needs for the transaction and will end up with a much larger piece of the company. 3. Company has made wrong decisions in the past, but it was forced to make these decisions by a “short sighted” market. Once it becomes a private business, it can make the right decisions for the future. The pitfall: That is an interesting argument, but the onus for backing it up then has to be on Dell (the man and the company) both in terms of what has been done and future plans. Looking backwards, what is it that the market has forced Dell to do over the last few years? Did it force Michael Dell to spend money on these past acquisitions and investments that are not paying off? Did it force him to make the big bet on enterprise solutions? If so, how did that happen? Looking forward, what is it that Michael Dell plans to do differently? And what is the basis for his claim that these actions will not be received well by the market. It does not seem fair to blame a market for reacting badly to changes he has not made or even made explicit. A fair fix: Let us start with a mea culpa from Michael Dell for mistakes made in the past and an explanation of how the market forced those on him. He should then continue by putting forth the changes that he plans to make to the company, once he takes it private. Let the market react to these changes and he can then pay a price based on that reaction. 4. This is not about value, price or changing the way the company is run. Michael Dell is just tired of running a company in the market spotlight, with the stresses of answering to stockholders, analysts and rating agencies. He just wants to go back to running a private business. The pitfall: Okay, fair enough, and I feel bad for Mr. Dell, but he got his riches from playing in the same market spotlight. Is he willing to return all that cash back to the market? I know that he is investing more than just his stake in the company but how much of his total wealth will be in invested in a private Dell? Also, has he made clear to Silver Lake, his private equity partner in this transaction, that this deal is not about making money but bringing him inner peace? Finally, does he really think that the lenders who lent $15 billion on this deal will be more forgiving than stockholders of mistakes? A fair fix: Michael Dell takes the company private, and either invests back in the company all of the gains he made from the public marketplace or gives it to charity. Also, let’s get an iron card guarantee from everyone involved in the buyout that Dell will not be going back public in 5 or 10 years. As investors in Dell, what are your choices? I see three possible ones, depending upon how much energy and resources you are willing to pour into the battle. The Primal Scream: You have your “Howard Beale” moment, where you take the best price that Michael Dell will offer, but not before you rant and rave about how unfair the world is to investors like you. Storm the castle: You go for the win. You will need large institutional investors to follow Southeastern Asset Management’s lead and rouse themselves from their slumber and join in the fight. To get you started, here is are some of the largest institutional stockholders as of the last filing: T. Rowe Price (4.41%), Blackrock (4.32%), Vanguard Group (3.63%), State Street (3.58%). After all, Dell owns only 14% of the shares and you could create a coalition that could this deal. I am not a stockholder in Dell, have never been excited about the company, but I will contribute a small part to your struggle. I valued Dell, using my estimates, and arrived at a value per share of $16.38/share. You will, of course, have different views about Dell's future and arrive at a different value. Go ahead and download the model, value the company, and let’s get a shared Google spreadsheet going. Revolutions start with small protests. Here is my sense of this deal. At $13.65/share, Michael Dell is probably getting a bargain, but I don't think it is a huge one. As a consequence, it is going to be difficult to find another buyer who will offer a significant premium over the buyout price. I also think that Dell's depleted value today is a consequence of Michael Dell's management over the last few years and it bothers me that he will be benefiting as a result of his own mistakes. If nothing else, as a Dell stockholder, I would like an honest admission from Michael Dell that the wreckage at Dell is not the market's fault but his own, and a couple of dollars more per share on the buyout price will soothe my pain a little. If you are an Apple stockholder, yesterday was an eventful day. First, you had David Einhorn becoming more “activist” with his Apple holdings, moving from being just bullish on the stock to pushing for change. Second, Einhorn also unveiled his plan for Apple: the company should give its stockholders preferred shares in the company, with a 4% dividend yield. In pushing for the change, he is quoted as saying that doing so will “unlock billions of dollars in value". There will be NO value created.. none.. The first law of thermodynamics, applied to value: You cannot create value out of nothing and giving preferred stock to your common stockholders is a “nothing” act, as far as the value of the company is concerned. It will not increase the cash flows from operations nor will it alter the risk in Apple’s business. The cost of capital will not change: This action will not change the cost of capital. At first sight, it looks like it should since the cost of preferred stock, at 4% (assuming that it trades at par) is much lower than Apple’s current cost of equity (which I estimated at 12% or higher). However, that savings is a mirage, since common stockholders will now have to price in the risk of the additional commitment that has to be met (the preferred dividend) into the cost of equity. If this were not true, every company with a healthy cash flow (Coca Cola, Microsoft, Google) could become a money machine, granting preferred stock to its common stockholders. The constant PE ratio is a myth: The most cringe worthy argument that I read yesterday was the one that went as follows: Apple currently trades at a PE of approximately 10.2, $450/share on earnings per share of $44. If you grant each common stockholder a $100 preferred stock, with a dividend of $4, your earnings per share will drop to about $40, and preserving the same multiple will generate a value per share of $400. Add that on to your preferred stock that is worth $100 and you have valuation magic: you have created $50 in value. This is the worst kind of nonsense, since it is nonsense with a believable twist to it, and that is why it has been investment conman’s favorite tool over history. The PE ratio is not a constant, and it will change as you change the nature of your equity risk or cash flows, as you are in this case. Bottom line: If Apple’s share were trading at fair value today (let’s say, at $450/share) and each Apple shareholder were granted a preferred share, with a preferred dividend of 4% and face value of $100, here is what the shareholders will end up holding tomorrow: a common stock with a value of $350 and a preferred share with a value of $100. There could a trust discount attached to the cash balance, because investors are worried that Apple might be tempted to do something stupid with the cash, and with this much cash, there is only one action that can do you significant damage and that is overpaying on a really large acquisition. Investors may fear that while the cash builds up in Apple, they may never see the cash, because managers are so attached to it that they will not let go or because it is trapped and therefore unavailable for user, due to tax reasons. If investors are discounting cash for one or both of these reasons, the preferred stock may serve to increase the price because it commits Apple to returning the cash (in the form of preferred dividends) in perpetuity. Presumably, “relieved” investors will now breathe a sigh of relief and remove the discount on cash, causing the stock price to go up. The upside is limited to the discount on the cash. Even if cash is being treated as worth nothing today (which would be a 100% discount), that would translate into $140/share. Increase common dividends: The simplest and least involved alternative is to increase the common dividends per share from the existing level of $10.60 per share to a higher value. In fact, if you are looking at granting a $100 preferred stock with a 4% dividend to each common stockholder, you could create an almost equivalent commitment by just raising dividends per share by $4/share. I know that the commitment is a little weaker, since common dividends are not guaranteed, but given how sticky common dividends are (healthy companies very seldom cut common dividends), but not by much. In fact, since investors tend to build in expectations of growth into common dividends that will not get built into a perpetual preferred share, the net commitment effect may actually be neutral. Buy back stock or pay a special dividend: If investors distrust you with cash or are discounting it, the best response is to return in right now, rather than commit to return it to the future. The problem for Apple, though, is that a big chunk of the cash cannot be touched unless Apple decides to pay the “differential tax” (between the foreign tax rate and the US tax rate) on the trapped cash (estimated to be $80 billion+ of the cash balance). With Apple’s cash balance, though, you could still put together a substantial buyback ($40 billion) and commit to more buybacks in the future. The commitment to make interest payments is far stronger than the commitment to pay preferred dividends, since the consequence of failing to make interest payments is default. That is why there is a limit to how many bonds you can issue, before the trade off starts to work against you. Faced with these four choices: the Einhorn preferred stock grant, an increase in common dividends, a stock buyback/special dividend and bond issuance, there is one final consideration to keep in mind. The common stockholders in Apple have to think about the consequences of each of these for their personal taxes. With the common dividends and buybacks, we are on familiar ground and the effect on taxes is straightforward. Dividends will be taxed at the 20% dividend tax rate for most individual investors, as will the capital gains that arise from a buyback and are close to equivalent (though there is a tax timing option embedded that gives the latter a slight advantage). With the granting of preferred stock or bonds to existing stockholders, there is an added tax twist to consider. The preferred dividends will get taxed at 20% whereas interest income from bonds is taxed at the ordinary tax rate (higher than 20% for most investors), giving preferred dividends an advantage over bonds (but not over common dividends/buybacks). In addition, from my limited understanding of tax law, the grant of bonds will be treated as income at the time of the grant whereas the grant of preferred stock will not. (Thus, the Apple stockholder who receives a $100 Apple bond will be treated as having income of $100 in the year of the grant, whereas the receipt of $100 in preferred stock will just reallocate the basis for the Apple stockholding). Bottom line: If the objective behind the preferred stock is to remove the “trust” or the “trapped” discount on cash, why create a complicated mechanism, when a simple one will do? Just raise common dividends, if you do not want to open the door to debt at the moment, but leave that door ajar for the future. Control freaks: The use of preferred stock is widespread in some parts of the world, such as Latin America, but it takes both a different form (from US preferred) and often has a different motive. In much of Latin America, preferred stock does not entitle you to a fixed absolute dividend but instead gives you a first claim on the dividends and a percentage of the profits. Thus, these preferred shares are really common stock without voting rights. They are used by companies, where insiders hold the voting shares and have no desire to be accountable to the capital markets. Young and start-up firms: Young firms often use preferred stock to raise capital because they want to raise capital, without diluting the existing owners’ stakes in the companies. For these companies, the tax benefits of debt are irrelevant in the decision process, since they are often money losers, and the risk of default is too high. To sweeten the pot for investors, they will often add the option to convert into equity to the preferred stock (creating convertible preferred shares). Financial service firms: Financial service firms use preferred stock because some measures of regulatory capital allow them to count preferred stock as part of capital. Thus, while they view preferred stock as expensive debt (since it does not have the tax advantages), it does serve the purpose of augmenting regulatory capital. Studies of both US and European companies suggest that when CFOs are asked about their preferences on raising funds, there is a financing hierarchy. Topping the list as most favored is straight” debt and at the very bottom of the list is preferred and convertible preferred. For non-financial service firms, the issuance of preferred is more a sign of desperation than it is of health. No matter what you think about Apple’s prospect, I don’t think you would view them as being desperate for new capital right now. If David Einhorn’s idea is a non-starter when it comes to value creation and not particularly effective even as a price catalyst, he is not alone in his sales pitch. In fact, what he is doing is widespread among companies, consultants and banks and I would propose three changes in the way restructuring plans/ proposals are presented to investors and public. Stop using price and value as interchangeable terms: Much of what passes for value creation in many companies is not what it is made out to be. I have seen the hue and cry around stock splits, issuing tracking stock and accounting restatements of assets on balance sheets and wondered why we make such a big deal about these actions. All of these tend to be purely cosmetic and have no effect on value. However, they could impact stock prices, if there is a gap between value and price. So, let’s require truth in advertising. When you talk about value enhancement or creation, be specific: If an investor, company or consultant claims that an action will enhance value, the onus has to be on the claimant to explain where the value increase is coming from. Simply put, it has to come from increasing cash flows in existing assets, reducing the risk in these cash flows, improving the tax benefit/default risk trade off or from growing more efficiently (improving competitive advantages). That is a broad canvas and every true value enhancing action has to wend its way through one of these paths. If you are talking about price enhancement, say so: If you believe that taking an action will increase your price (and has nothing to do with value), don’t claim otherwise. Here again, be specific about what market mistake or friction you are exploiting. If at the limit, your argument is that the price will go up because investors are naive or stupid (which is the basis for the constant PE argument), you might as well say so. In closing, I am glad, as an Apple stockholder, that David Einhorn is rocking the boat, even if I think his proposal is the not the most effective catalyst or game changer. It opens the door to a healthy discussion about how Apple should deal with its large and growing cash balance, and that is a good thing for all concerned. I know that you are probably sick and tired of reading about Apple, and I am getting close to that point too, but this post is really more about investing than it is about Apple. In my post on Apple on January 27, I also posted "my" distribution of value for Apple, concluding that there was a 90% chance that Apple was under valued. One of the responses I got was interesting and it questioned the courage of my convictions by asking why, if I believed that there was a 90% chance that the stock was under valued, I would not "bet the house" (I put a 10% cap on Apple in my portfolio). That, of course, gives me a platform to return to a theme that I have harped on for much of the last year: that valuation and pricing are two very different processes and that many analysts/investors often being confident about one does not imply confidence about the other. To set the table for the comparison, let me start with my assessment of the differences between the valuation and pricing processes. The value of a business is determined by the magnitude of its cash flows, the risk/uncertainty of these cash flows and the expected level & efficiency of the growth that the business will deliver. 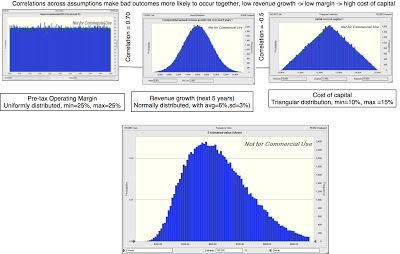 While discounted cash flow valuation may be one way of estimating this value, there are other intrinsic value approaches that also try to do the same thing: estimate the intrinsic or fair value of a business. The price of a publicly traded asset (stock) is set by demand and supply, and while the value of the business may be one input into the process, it is one of many forces and it may not even be the dominant force. The push and pull of the market (momentums, fads and other pricing forces) and liquidity (or the lack thereof) can cause prices to have a dynamic entirely their own, which can lead to the market price being different from value. How confident are you about the magnitude of the gap? Since you know the market price, this is entirely a question about the confidence you have in your valuation. How confident are you that the gap will close? This, unfortunately, is generally not in your control and will be driven by the pricing process. What are the catalysts that can cause the gap to close? If the gap is to close, the price has to move towards your value and you need "something" to get it started. In sum, whether you invest will depend upon the answers to all three questions. You could, therefore, find a big gap between value and price, feel confident about your estimate of value and not invest in the stock, if you don't feel comfortable with the forces that are driving the market price or hopeful about catalysts in the near future. Let me apply this structure to Apple to reconcile my assessment that there is a 90% chance that Apple is under valued at $440/share and my decision to cap my holding of Apple at 10% of my portfolio. 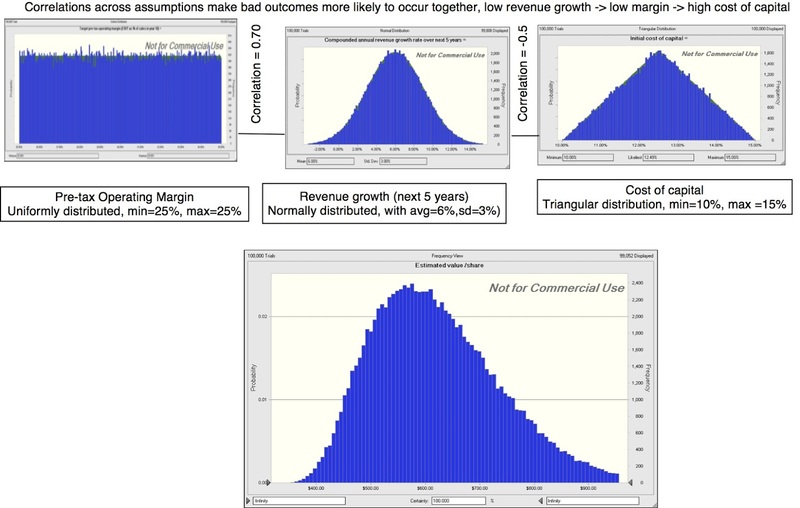 All that I did to arrive at the 90% estimate that Apple was under valued was count the number of simulations that delivered values less than $440; in reality, it was closer to 94% but I rounded down to 90%. Note that to end up at values less than $440, the distributions for the key variables all had to be close to the "bad" ends of their distributions. Thus, for Apple to be worth only $440 (or less), you would need negative or close to zero revenue growth, pre-tax operating margins of 25% (current margin is closer to 35%, down from 40% plus a year ago) and the cost of capital would have to be at 15% (the 97th percentile of US stocks). (a) Information: Are you using information in your valuation that the market does not have yet? I know that this would be dangerously close to insider trading in the US, but it is possible that in some markets, you have to access to proprietary information. The gap will close when then information is revealed. With Apple, I used the company's filing with the SEC, and there is no private information in the valuation. I have exactly the same information as everyone else in the market does. (b) Liquidity: Are there market trading restriction or liquidity barriers that are preventing the price from adjusting to value? If you have a lightly traded stock, with minimal float, it is possible that the price may stay different from value, until trading picks up. If the stock is over valued (price > value), there may be restrictions on short selling that prevent the price from adjusting to value. With Apple, given its market cap and liquidity, I don't see this as a a problem. 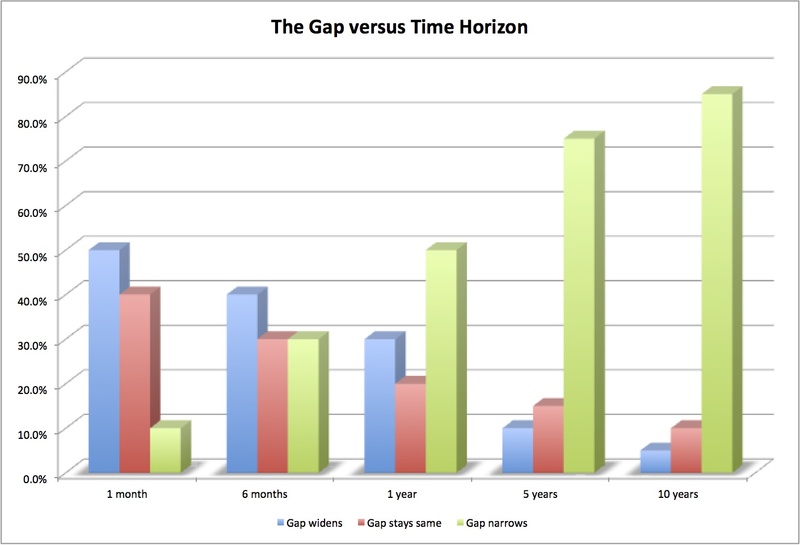 Over the next month, there is a higher chance that the gap will increase rather than decrease, but as the horizon extends, the likelihood of the gap increasing drops. But here is the bad news for intrinsic value investors. Even with a 10 year time horizon, and assuming that you are right about value, there is still a non-trivial chance that the gap will get bigger. Hence, there is good basis for the old Wall Street adage: that the market can stay irrational longer than you can stay solvent. a. Be your own change agent: As investors, it would be nice if we could tilt the game in our favor by having some influence over the gap. While you and I may not be able to do much to alter market dynamics, this is a place where activist investors with enough money and access to megaphones can make their presence felt. And the good news for the rest of us is that we can sometimes piggyback on their success. As Apple investors watch Nelson Peltz tussle with Danone and Bill Ackman take on Herbalife, they may find fresh hope in David Einhorn's frontal run at Apple. b. A company act/decision: While publicly traded companies often play the role of helpless victims to the pricing process, they feed the momentum beast when it works in their favor. In my last post, I noted some actions that Apple can take to cause prices to move towards value including being more open about their long term plans, returning more cash to stockholders and finding new markets to disrupt. c. A market shift: It remains one the great mysteries of markets. Momentum has a life of its own and it does shift, often in response to small events. While I am not a tape watcher, I believe than trading volume shifts, historically, have been better predictors of momentum changes than watching pricing charts. So, if your technical analysis skills have not rusted, get busy! Speaking of Einhorn, the news stories today are about his suggestion that Apple issue preferred shares to its common stockholders with a 4% dividend. I am afraid that this post has already gone on too long for me to comment at length, but here is what I believe. Issuing preferred shares will have no effect on value (so, forget about unlocking value...) but the best case scenario is that it will be a price catalyst, by convincing (some) stockholders of the company's commitment to return cash to investors in the future. Cryptic, I know.. but I will have a separate post on it tomorrow. Summing up, my high confidence that there is a big gap between value and price (that Apple is under valued) is tempered by my low confidence, at least in the near term, that the gap will close substantially and that there will be a dramatic game changer (catalyst) in the next few months. While I have a long time horizon, it is not entirely within my control (since I have no idea what financial emergencies may lie in my future), and hence my cap on my Apple investment. In fact, it was the fear of the havoc that these forces could wreak that led me to sell Apple in April 2012, when the stock was trading at $600+ (at my estimated value of $700, there was a 60% chance that it was under valued). As those of you who have been reading my blog for a while know, I have been posting my valuation and corporate finance classes online. A year ago, at the start of my Spring 2012 class, I provided my rationale for doing so, which is that the modern university business model is broken and inefficient and that change is needed. At the start of the Fall 2012 valuation class, I pointed to the lessons that I had learned from the earlier semester and the tweaks I had made as a consequence. The learning continued through the semester and I hope to incorporate what I have learned this semester, since I will be offering my corporate finance and valuation classes online, as in prior semesters and I hope that you will be able to join in (at least for portions). The classes start on Monday (February 4). You can follow my corporate finance class or my valuation class, or if you are a glutton for punishment, both. The webcasts can be seen in one of three formats: a direct stream from the NYU server, a downloadable video file that you can watch on your computer at your own leisure and a downloadable audio file, if you want a smaller file with just lecture audio. In the interests of not straining the NYU servers (and creating some backlash for me), please try to use the downloadable versions of the sessions, if you decide to use this forum. The classes are scheduled from 10.30-12, Monday and Wednesday and should be accessible a few hours afterwards. When prompted, enter this code: NHHXJU. You should be added to the class and you will get emails when anything is posted to the class site. If you find that bothersome and would prefer to check at your own convenience, you can go into your settings on Lore and turn off the email prompting (though you may not be able to turn off my postings… the privileges of being the instructor). Alternatively, you can enter this enrollment code (KA3-L7J-E46) into your iTunes U app and the class should be added to your library. Again, you will be prompted, whenever I post anything to the site but you cannot post directly on the site. They will also be carrying my Spring 2013 class and the link should show up on the site shortly. The valuation class is a second-year MBA elective course and many of the students in this class have already taken my corporate finance class. However, the class is a stand-alone class that does not require corporate finance. If your interests lie primarily in valuation, you can just take this class, which is about valuing businesses: public or private, small or large, developed or emerging market. It is not a theoretical class. In fact, I firmly believe that there is little theory in valuation and that almost every big question is a pragmatic, estimation question. By the end of the class, my objective is that you will have both the tools and the big picture feel to value just any type of business. As with the corporate finance class, you will have four ways of taking the class. All of the caveats and notes that I posted about the corporate finance class apply. The classes are scheduled from 1.30-3, Monday and Wednesday and should be accessible a few hours afterwards. When prompted, enter this code: WHKP39. Alternatively, you can enter this enrollment code (KKY-C8B-D56) into your iTunes U app and the class should be added to your library. Again, you will be prompted, whenever I post anything to the site but you cannot post directly on the site. The Spring 2013 class will be added soon on the site and you can follow online in real time. b. Make individual sessions detachable: Many of you already know corporate finance and valuation. If you prefer to dip in and just take a session or two, it should work. c. Create shorter versions of the lectures: I know that 80 minutes online is way too long. I am creating 15-20 minute versions of each of the lectures and hope to have those online sometime during the semester. Hopefully, that will relieve the time crunch. a. The Lore social media site: I plan to post questions and topics on this site for general discussion. Please feel free to post your questions and responses there. b. Class pop quizzes: I will post the pre-class test that I start every valuation class with (with the solution) and a post-class quiz that you can take to see if you get the concepts in the class. c. Regular quizzes & exams: While I cannot grade all of the quizzes/exams, I will provide you with a grading template that you can use to grade yourself. d. Projects/ Valuations: Both classes revolve around real time, real world projects where you analyze a company or value it. I will try to guide you along, on these projects, but here again, I will not be grading them. I will still provide a template you can use to assess yourself. If you decide to join either class, I hope to see you Monday.